Eleven Spartans tackled the Watford hills for a chilly half marathon. They came back with a bronze medal and a new personal best. ERICA GRAYSON has been running with the Spartans for twelve months and her first race last year was the Watford Half. This year she had a fantastic time running with JULIE SHADBOLT and took 5 minutes 29 seconds off last year’s time coming in at 2 hours 3 minutes 40 seconds. She’s very happy with that good start to this year’s running. Spartan ADRIAN BUSOLINI ran a great new personal best of 1 hour 26 minutes 26 seconds. JIM BROWN won the county BRONZE medal by 26 seconds having overtaken the fourth placed Vet 60 runner in the last 500 metres. He was exactly one minutes ahead of the fifth. The Watford Half is a popular open race but included the Hertfordshire county championship for veteran runners. An eighty minute run is a tremendous minutes achievement on such a tough course and fastest from Fairlands GRANT RAMSAY was 49th out of the 1875 finishers in 1 hour 20 minutes 51 seconds. He was fifth in the county championships for veterans 40 plus. RUTH REILLY ran a tremendous 1 hour 38 minutes 8 seconds for a category seventh, the same time as TIM SABAN. CHRIS HOLLAND came in with 1:47:22, JAMES KILROY with 2:01:18 and ROBERT WRIGHT with 2:03:01. Spartan SHARON CROWLEY may have been the last in for the club but she still had more than 250 runners behind her with her 2:11:34. BRIAN WHITE has qualified for the England Masters team in the Birmingham 10K by beating 40 minutes and finishing third veteran 60 plus in the Chichester 10K. He was 176th overall out of 1506 in 39 minutes 58 seconds. Brian enjoyed a very flat fast course finishing with a complete lap of the Goodwood Race Circuit. 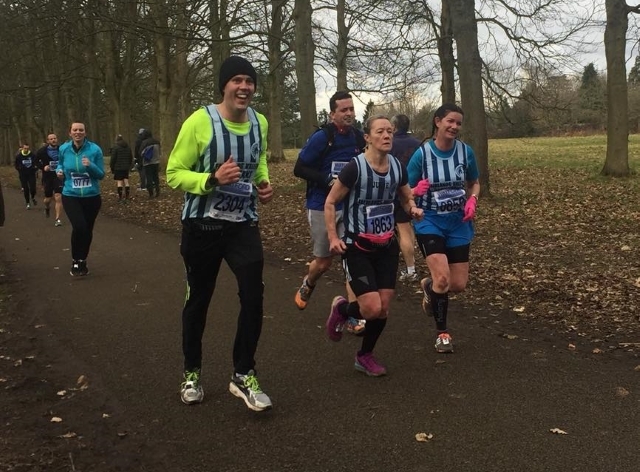 New members JONATHAN and HAZEL JONES competed in the Cancer Research 10K Winter Fun Run in London. Jonathan finished in 56 minutes 7 seconds and Hazel in 1:25:37. GERRY ROSEN improved his personal best (PB) by more than six minutes finishing in 1:00:22. Spartans JOHN NELMS and RICHARD HAZLEDENE finished the Thames Trot Ultra Marathon on Saturday in 10 hours 50 minutes. The event started in Oxford and followed the Thames river tow path all the way to Henley. While the point to point distance between these two locations is only 22 miles following the meandering river makes it just under 50! In cold and wet conditions, not getting about five degrees, the main feature of the run was mud. In places the mud was six inches deep and the trail only just passable. This came just three weeks after John and Richard completed the Country to Capital Ultra – a mere 43 miles from Wendover to central London. The Spartan open club championship results will be released at the champions’ night, presentation evening, dinner and disco on Friday 23rd February. 239 different individuals completed at least one event in the short championships and 156 in the long championships. The long distance championships for women and men consist of the best three out of 10 miles; half marathon (13.1 miles); 20 miles and full marathon (26.2 miles). All performances must be in accredited, measured races. The short distances are the best three from 1500 metres; 5K; 5 miles and 10K. On a wet morning DANNY SCANLON filled his recent customary “first Spartan home” position at Stevenage, finishing 7th in 19:57. STUART ARCHER ran a new course PB of 21:04 in 9th and BARRY OSBORNE was 10th in 21:07. MARTIN DUDLEY, MARK BEASLEY and RYAN DUNNING all made the top 30, and there was also a new course PB for DAVID SCOTT, finishing just outside the top 30 men in 23:48. CLAIRE EMMERSON was the first Spartan woman to finish, 5th in a time of 24:30. KAREN PALMER was the third Spartan with a new course PB at Stevenage, coming home 8th in 26:11. KAREN ELLIS was 24th in 28:55. ERICA GRAYSON and JULIE SHADBOLT also finished in the top 30. Elsewhere there were new course PBs for DAVE SMITH at St Albans (17th in 20:02), ANDY JAY at Westmill (12th in 25:00) and NICOLA KENNEDY at Nobles (2nd woman in 24:44). There were also Spartans in action at Hyndburn, Alice Holt, Forest Rec, Panshanger and Harlow.